Drawn by the rolling hills, rich soil and mild winters, every major grape found in the world can be grown in North Carolina. Winery tours and tastings have become increasingly popular among many. Add Alleghany to your list and taste what you have been missing. Located in the heart of the Blue Ridge Mountains near the Blue Ridge Parkway in Laurel Springs, NC, Thistle Meadow Winery offers individualized tours of the family-owned winery. Their tastings include wines made from grapes grown around the world. They create a wide variety of red, white, and blush/sweet wines, ranging in taste from dry to sweet. The award-winning wines are hand-crafted in small batches to ensure the highest quality. Just recently, they were ranked third among North Carolina wineries by the South Eastern Winery Review and scored a perfect "10" in friendliness. If you like drinking good wine, you'll enjoy making your own even better! Not only will you save money - it only costs anywhere from $2.50 to $5.00 per bottle to make - but you'll be amazed at the quality of your wine from the very first attempt. 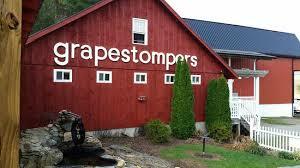 Even if you've never made wine before, grapestompers can help you make your first batch of wine a success. We offer a free online winemaking tutorial and stock all the winemaking equipment and supplies you'll need to create a great tasting wine!